Clifton Davis - Call on Dolly! As a young man, Clifton was fascinated with theater. Having seen only one Broadway show, and determining from seeing that show, he knew he had to pursue a career in this business. He was so entertained, so captivated, so compelled by this production of The Apple Tree starring Alan Alda that he decided to drop his career in electronics and pursue an entertainment career. He resigned from being a video engineer at ABC television and he became an apprentice in the theater at a summer stock theater, St. John Terrell’s famous summer stock theatre, The Lambertville Music Circus in Lambertville, New Jersey right across from New Hope. He went there for the summer and performed in five plays, two children’s theater productions and three regular productions. Armed with this limited and seemingly small training, he started auditioning for Broadway shows. He heard of an open call for Hello, Dolly. Out of hundreds of people who auditioned, he was picked for one of three male singers needed and he was hired for the chorus. They had already gotten three from the Equity call. 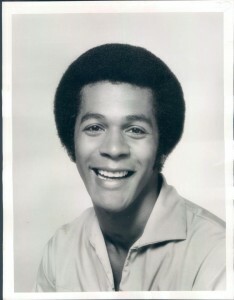 That’s how Clifton Davis became part of the Hello, Dollyfamily. He went to Washington DC to play the National Theater and then on to Broadway. All totaled, he was with the show for one year. Hello, Dolly continues to entertain audiences. It has a great book. It has a great score. It has a charming story, adventure, love, laughter, and dance. It is quintessential musical theater. It is escapist. It is a period piece. In essence, it is timeless. Those are the reasons it lasts. It is so simple. It is so rich and what a great job Jerry Herman and Michael Stewart making it so seamless. Being a songwriter and having a decent career as a songwriter, with Grammy nominations, etc, also a friend of Paul Williams, another great and under rated songwriter of great American music that is such a part of our consciousness, they all share the view that brevity is the key, saying it with fewer words in the most poetic way. Clifton finds that the lyrics to the songs and the book of Hello, Dolly were so simple but powerful. If he had the chance to do it all over, there is nothing he would have done differently. In fact, he is proud as a peacock of getting into Hello, Dolly, becoming a part of that timeless and memorable cast. In all of the experiences he had while working with Pearl Bailey and Cab Calloway for that year was one of those seminal moments for Clifton. It was life changing and one of the greatest years of growth in his life. He learned about acing, he learned about creating a character; he went to acting school while he was appearing on Broadway. Rather than just being a chorus singer, he became an actor. Not only that, during that period of time, he became a professional songwriter. All of those things happened while in Hello, Dolly!, each of those having an anecdote or two attached to it. Clifton brought a singing voice to Hello, Dolly and a passion for the theater. He also brought innocence. In terms of theater, he WAS green. He had to learn and grow every day in that production. He became friends with people that he had never met. He learned lifestyles that he had never seen before. He grew that year. It solidified his desire to make acting and musical theater and performing arts his career and we’re all better for it. Clifton believes Hello, Dolly should always return to Broadway! Dolly has to obviously be someone who sings and has charm. He has to give it some thought as to who that might be. There are so many things to like about having been in this show, the celebrities that he met backstage who came to see Pearl Bailey. Many of the chorus members got to meet the celebrities themselves. Clifton got to meet Sammy Davis, Jr. while in the chorus. He came to see Pearl Bailey and he came backstage and greeted the entire cast. Clifton said, “Mr. Davis, my name is Davis, too.” He said to Clifton, “You know? One of these days, we Davis’ are going to take over the world.” Clifton said, Yes sir!” Years later, Clifton reminded him of that when they became friends. He was invited many times to Mr. Davis’ private home in Beverly Hills. Sammy told Clifton he was beyond a triple threat: he sings, he dances, he acts, and he writes music. He told Clifton that he liked that about him. It reminded him of him. When one stream dries up, he could drink from another. Miss Bailey was rough on the understudies. She preferred if none of the cast members were ever sick or ever out. She desired that her regular cast be with her at all times. She felt they were wonderful and gave her the support she needed. Whenever one of the principals was out sick, she wasn’t the happiest person. The poor understudy who had to go on with her had to get her disdain. He doesn’t mean that she was mean, she was just unhappy that an understudy was on instead of her principal. Clifton was the understudy for Cornelius Hackl. Jack Crowder (as he was called at the time…he eventually changed his name to Thalmus Rassalala) who was playing Cornelius got sick. Clifton had to go on for a period of time. This was ten months into the run. Clifton had never been on in this role before. When he did, she looked at him that first performance very strangely as he came on for their first scene together. Finally, he had to dance with her and play this part. When they finally came off stage well into the first act, she turned to him and said, “You’re alright.You’ll be just fine.” Clifton can’t put into words how complimented he was. He was the first understudy to get a compliment from Miss Bailey. She became “the Mama”. He was one of those chorus kids that called her Mama. From that point on, she was sweet as she could be to him. Years later, they ran into each other on the street in Washington DC. 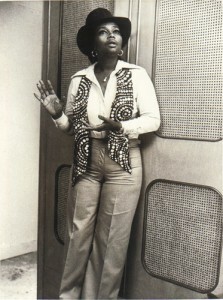 She was a huge fan of his television show, That’s My Mama. She just bubbled, claiming him as one of her children who emerged from Hello, Dollyand had a stellar career. He went immediately from Hello, Dolly into a show called How to Steal an Election. He was now a lead character, one of the stars. It was a very special time in his career. This production of Hello, Dolly was directed by Lucia Victor. Gower was busy with I Do! I Do! Most of Lucia’s time was spent working with the ensemble as opposed to the principals. Lucia worked with broad strokes, she worked with a sense of feeling and a sense of what they were really about in terms of adding to each musical number and scene, how they were to stay alive and pay attention and listen and not to be distracting or distracted while they were on stage. Their job was to give it their all. Gower actually came in for a couple of days of rehearsal. It was if the Lord had walked in the room. He gave notes to some of the dancers and actors. He was just as charming and nice as he could be. He later hired Clifton to play Joey in his production of Pal Joey with Lena Horne. It was wonderful working with him. Clifton was so green at the time that he was frightened of Lucia and these important people of the theater. Whatever they said, he took to heart. He volunteered for as many walk ons as he could, thinking he could say a line here or there. A lot of the experienced chorus members did not understand. They advised him not to do that. If he did, he wouldn’t have time to relax. He was constantly changing costumes throughout the show and running on to do his next bit while everyone else was playing pinochle downstairs. Being in this production of Dolly, he learned a love for the theater that continues to this day. He learned that there was a life force on that stage that was beyond the ranks of normality. There was something unique and special about the energy of a well constructed, well performed play/musical. It was one of the most unique experiences in the theater of any. It was the first previously white show that had gone all black AND had so much success. It was historic in that regard. 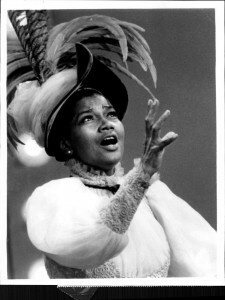 To have Pearl Bailey, whose performance was phenomenal, nothing short of phenomenal! She was the funniest and most talented Dolly certainly ranking right up there with Carol Channing. She was phenomenal NIGHTLY and lived on that stage. She came alive on that stage more than real life. There was something that was very special about the theater and that responsibility and for that production and that role all converging together. There was only one negative experience for Clifton with this production. It was when he got ready to leave the company. He went to Miss Bailey and told her he got the lead in an off-Broadway show and that he would be leaving. She wished him well and told him she knew he would be very successful. She was very gracious; she was being Mama. He went to Cab Calloway expecting the same results. Instead, Mr. Calloway cussed him out! He told Clifton that he was a fool to leave this show. As an older man and with more experience under his belt, Clifton now understands what Mr. Calloway’s perspective was. Mr. Calloway told him that this was a once in a lifetime experience. He was told these types of shows don’t come along. Mr. Calloway told him this show would go for at least another year, and it did. He was told that in this business he does not know when another show would come along that could last as long. He was told that if he walked away, he was a fool. Somebody else was going to get the parts, and he would be gone. Clifton was heartbroken because he expected a more paternal encouraging response. As it turns out, Clifton had tremendous success. His career was launched by Hello, Dolly. After leaving Dolly, Clifton never saw Mr. Calloway again. 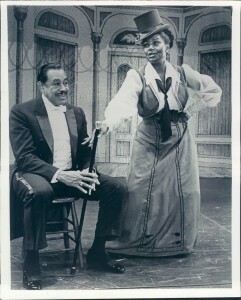 Other than Pearl Bailey, the only other Broadway Dolly that Clifton saw was Bibi Osterwald. She was classic Broadway musical theater. She was very much a musical comedy actress and did a fine job. Beyond that, the only other Dolly Clifton has seen is Streisand in the film. He thought it was very good especially the added song, Love is Only Love. He thinks it was just wonderful. He also feels that it showed Streisand as a great actress playing this much older woman than she was at the time and so thoroughly making her just the right amount of “Jewish mother.” She was just the right amount of matchmaker. How little did he know while doing Dolly, because of his being so green, that there was such a thing as The Matchmaker! He thought she did a phenomenal job, as well. During Clifton’s run in Hello, Dolly, President Lyndon Johnson came to see the show. Pearl Bailey was a Republican. It was a powerful performance the night he was in the audience. He dated one or two of the chorus girls but no real romances for him. He had a crush on Emily Yancy. He says she didn’t have a crush on him. “I was a poor little chorus boy!” He had such a wonderful time when he got the opportunity to play Cornelius Hackl opposite Emily Yancy. “Wow! I loved dancing with her and singing to her!” Singing It Only Takes a Moment to Emily Yancy is the significant moment that stands above all others. Pear Bailey’s “third act” is something that Clifton is ambivalent about. It WAS thrilling to see her work the audiences the way she did each performance especially in this segment, just doing a monologue or just talking to the audience. The audience sat there eating out of her hands. She had them howling with laughter. She regaled them with stories for up to twenty minutes after the show. The entire company was standing behind her under hot lights and heavy costumes desiring to get out of those costumes and out of the theater. She made them all stand there while she did her act. Also, during the run, there was the assassination of Dr. Martin Luther King, Jr. There was a feeling, socially, outside of the theater that riots could possibly break out. In fact they did in several cities, but not in New York City. The company thought originally that Miss Bailey would cancel the show that night. No, Miss Bailey desired the show to continue that night. It was never mentioned. The show went on as usual. The “stand-up” after the show did not go on that night. There was a pall that came over the entire company. Although the audience didn’t experience it, there was less of a show that night. The company for the most part were finding out about the assassination as they were arriving at the theater. He was assassinated at the Lorraine Motel in Memphis, Tennessee on April 4, 1968, at the age of 39. King was rushed to St. Joseph’s Hospital, where he was pronounced dead at 7:05PM that evening. That news traveled like wildfire. Closing night for Clifton was a sort of graduation for him. The company and the cast were very warm to him giving him a going away cake. He left Dolly on a Sunday night and two days later he was in rehearsals for How to Steal an Election. It has been forty-five years, as of this writing, since Clifton took his final bow in Hello, Dolly! He has done so much since then. They got to perform on the Ed Sullivan Show AND The Tony Awards when Pearl Bailey was given her special Tony. This was so special to him. All of these things that happened around this show one of the most unique experiences of his entire career. What a way to kick off a career!